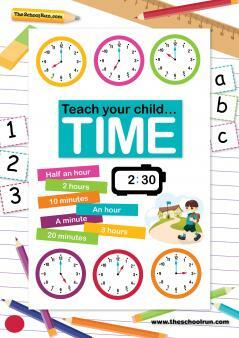 Telling the time is a core numeracy skill that your child will be taught in stages during primary school. From reading the time to the hour on a clock face to converting analogue to digital and understanding the 12-hour and 24-hour clock, you can ensure your child has picked up all the essential skills by working through the worksheets in this Learning Journey. They cover all the core learning objectives for each year of primary school. Either start at the beginning and work through a couple at a time, or pick worksheets that relate to specific areas of the topic that you know your child is learning at school or needs extra support with at home. Also check out our Telling the time section for lots more information, articles and top teaching tips. Teach your child time is a reference guide and home-teaching kit which will help you understand exactly what time-related skills your child is expected to have mastered in each year of the primary school curriculum. Primary school teacher and parent Alice Hart has compiled information, tips and activities to ensure that you have the right information at your fingertips so you can quickly make sure your child has fully grasped and achieved each and every skill for their correct year group and using the same methods that they are taught (rather than confusing them with the one you were taught at school!). You'll be able to print off highly targeted and child-friendly fun worksheets to help them master each of the essential skills as they progress through school – in fun, five-minute sessions.